Travel Leaders Group is proud to support communities and individuals facing hardships. Through three humanitarian outreach programs, we offer assistance, food and hope to those in need. Please visit each one below and support them in any way you can. The Family Bonds Foundation is a 501(c)(3) charitable giving organization operated by Travel Leaders Group that serves the needs of those who work in the travel industry as well as the broader community. 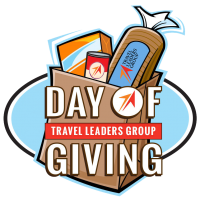 Every year, Travel Leaders Group employees, affiliated travel advisors and supplier partners come together to help end hunger by donating non-perishable food items, their time and money to hunger-related charities. The Tzell and Protravel Foundation supports a new cause every year. In 2018, they supported Direct Relief, a humanitarian aid organization that increases access to healthcare in all 50 states and more than 80 countries worldwide. For 2018-2019, the foundation is supporting the Pancreatic Cancer Action Network. Non-perishable items donated to local food banks.